In play, ‘loose parts’ are skirting the edges of nirvana. Ask any kid. Now they probably won’t call them ‘loose parts’. They’re more likely to use the generic and all encompassing ‘stuff’ prefaced by cool, awesome, or great. It might even go the way of ‘this stuff is epic’. Wood, rope, tarps, tires, milk crates, cardboard boxes, fabrics and apparently hay bales too can make up a loose parts inventory. It’s what the kids do with it that’s a real blast. They create, they build up and pull down, they improvise, they move, groove and PLAY! Now, thanks to Australian researcher Brendon P. Hyndman we have empirical evidence that loose parts in primary schools go way beyond a good thing. From the perspective of increasing physical activity, engaging a broad cross-section of kids and being light on constantly squeezed budgets, this study shouts out ‘Eureka!’ embrace loose parts play. Here are selected comments from A Guide for Educators to Move Beyond Conventional School Playgrounds…. published in the Australian Journal of Teacher Education. Quantitative data, as the charts below demonstrate, also offer a compelling storyline – given the opportunity, kids will choose to build and play with a variety of loose parts so much so that it becomes the dominant play activity. 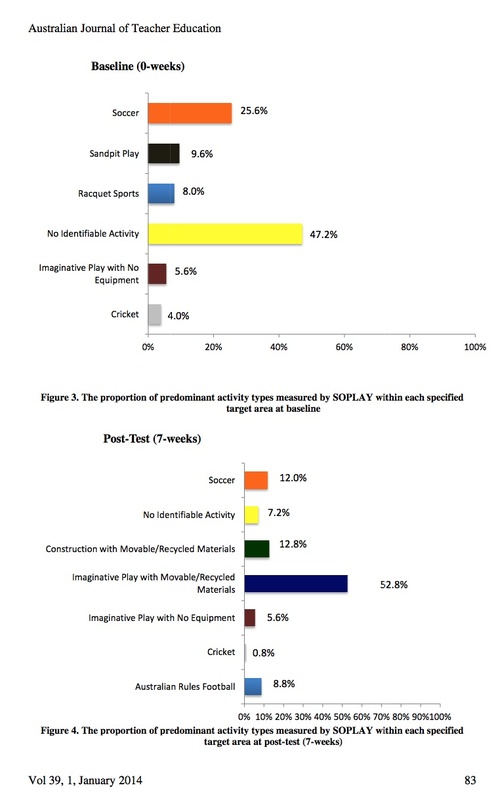 Given that many kids in Australia and elsewhere are getting the bulk of their physical activity and play within the school setting, in excess of 50% in some instances as cited in Hyndman’s study, these findings are significant. The effects of the loose parts intervention were measured at various stages over a 2 1/2 year period and engagement remained steady. Loose parts are an important part of the playwork canon and have strong roots in the UK within adventure playgrounds and with groups such as Pop-Up Adventure Play. David Rockwell’s Imagination Playground has also a taken a page from the loose parts experience in the creation of the big blue block play environments. All hail loose parts. They are the jazz of play bebopping the kids along in a wonderfall of spontaneity. There are downsides though that can’t be dismissed. 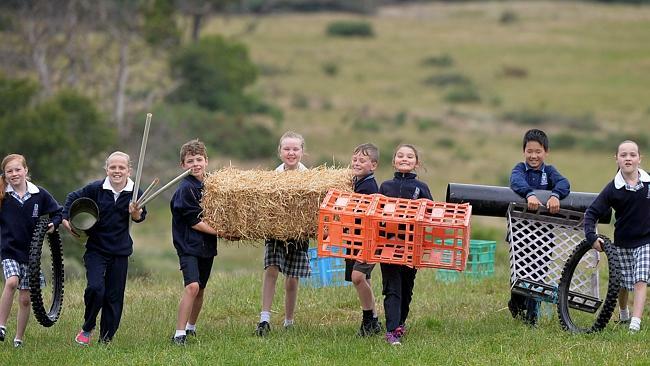 As more and more schools, neighbourhood groups and play schemes embrace loose parts, it just might start proving difficult to source the ingredients – milk crates, cardboard boxes and of course hay bales! Here are the kids, subjects of the research study, in action at Emmaus Catholic Primary School in Ballarat, Australia as reported by WIN News Victoria. We hope to get something on the go in Halifax this summer and we’ll let you know how it turns out. I have just started to put together a menu of ingredients and am wondering where I will be able to acquire some of them at little or no cost. 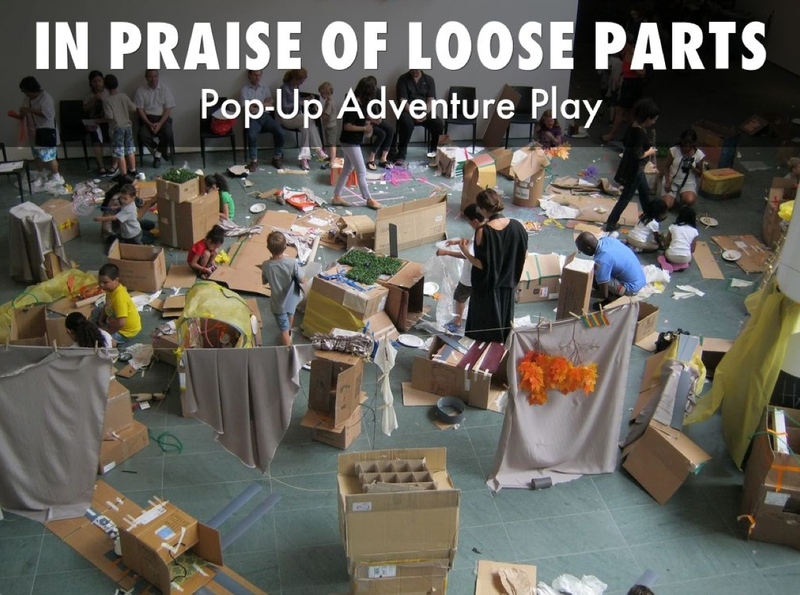 If any readers have put together a loose parts play event, I’d love to hear from you. Many thanks to Brendon Hyndman for his grand research. You can follow him @Dr_BPH. This entry was posted in A Guide for Educators to Move Beyond Conventional School Playgrounds..., Australia, Australian Journal of Teacher Education, Brendon Hyndman, Imagination Playgrounds, loose parts, physical activity, Play Advocacy, Play and Learning, Play research, PlayGroundology, pop-up adventure play. Bookmark the permalink. Hi Chris – thx for sharing. Keep us posted about your rekindled research and we’ll share that too if you’d like. Hope all is well with you and yours over the other side of the world. Cheers, Alex. Sounds great- what sorts of loose parts will be involved? I’m fine thanks, you (apart from getting excited)? I’ve got some standard stuff on the list – tires, netting, rope, milk crates, boxes, wooden beams but I’m also thinking of materials that reflect some traditional and contemporary livelihoods – just not sure what they are as yet…. Any suggestions from your end? Fascinating study…we found the same with our kids who liked pulling sheets, broom handles, clothes pegs, chairs and tables to build camps. Much more funthan static pop-up tents. Their play inspired us to create Kidcampz, the UK’s 1st multi-shape play tent that lets kids make any shape camp they like. With poles, connectors, clips, clamps and velcro straps they can get really creative and make their own fantasy space at home, in the garden, down the beach or in the forest. http://www.kidcampz.co.uk. Thanks for great article, thanks for posting! Simon.